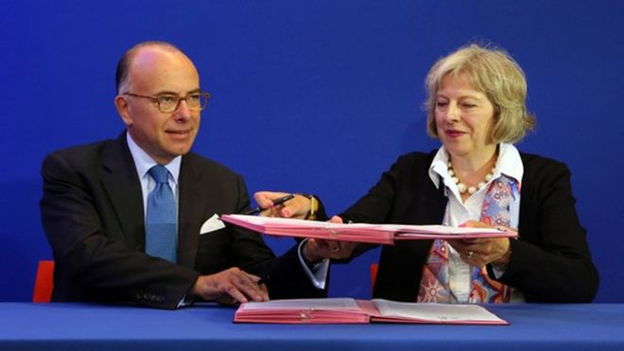 The UK and France have signed an agreement on new measures, including a "control and command centre", to help alleviate the migrant crisis in Calais. The centre will be jointly run by British and French police and will "relentlessly pursue" people-smuggling gangs, Home Secretary Theresa May said. She also said she was "well aware" of the risk that Calais security would push illegal migrants elsewhere. 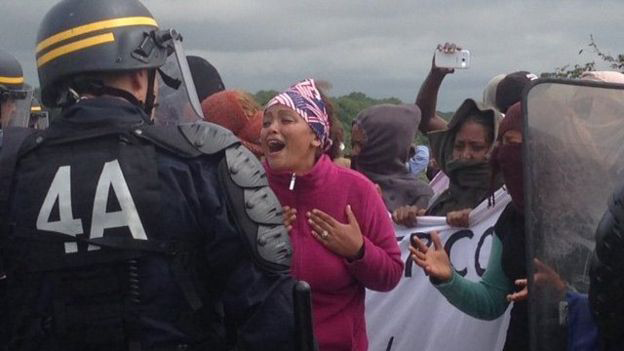 Meanwhile migrant protests brought cars to a halt on a motorway in Calais. The group was chanting "we are not animals" and "open the borders". BBC reporter Amanda Kirton said police were sent to the motorway which overlooks the Calais migrant camp known as the "Jungle" to disperse the crowd, and tear gas was used. About 3,000 migrants are thought to be camped in Calais in the hope of crossing the Channel. 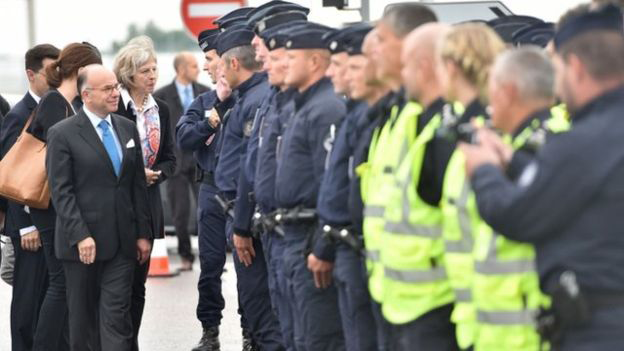 Mrs May said it had been a "difficult summer" with high levels of migrant activity and strike action in Calais, but joint efforts with the French government were working. She said the new command centre would "relentlessly pursue and disrupt the callous criminal gangs that facilitate and profit from the smuggling of vulnerable people, often with total disregard for their lives". The joint command centre, which will also incorporate the UK Border Force, will be led by two senior officers, one British and one French, each reporting to their own government. Mrs May said France and the UK would also work with other EU states to try to ensure there were "fully functioning external borders and an asylum system that is resistant to abuse". Her French counterpart, Interior Minister Bernard Cazeneuve, said asylum seekers should be welcomed "with dignity", but illegal immigrants would not be tolerated. The joint deal also sets out other measures aimed at tackling the migrant crisis in Calais, including an extra 500 police from the UK and France. There will also be additional freight search teams, including sniffer dogs. 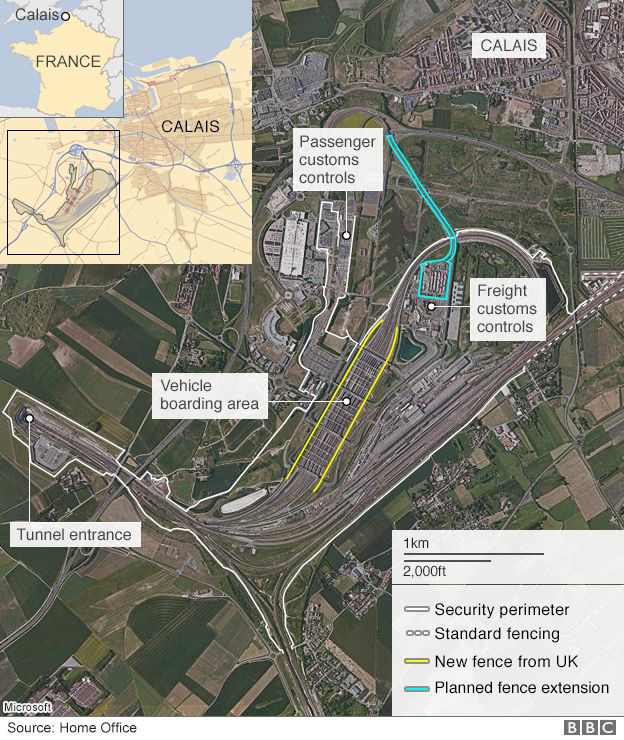 During a tour of the Eurotunnel site in Coquelles, Mrs May said the UK had begun talks with Belgium and the Netherlands, as the UK was "very well aware of the possibility of displacement" of people trafficking to other places due to increased security at Calais. Security at other northern French ports, such as Dunkirk, was being scrutinised, she added.